I would never use satire to give anyone a tweak. I'm a very serious minded individual. Everyone knows that. As I said...I have often wondered about this. We normally take our shoes off when we step in our homes, because we don't want to spread not only the mud and dirt, but, who-knows-what, onto our carpets and in to our rooms. I know that you take of your shoes, as do the Muslims, Hindus, etc. ....and I always remember God's instructions to Moses. I can only assume that we wear shoes out of Economia, due to most of us living in cold climates. Where do you do that? Show me a couple of examples. Says anonymous woman on the Internet. Not buying it. There can be no economia when it comes to heresy. 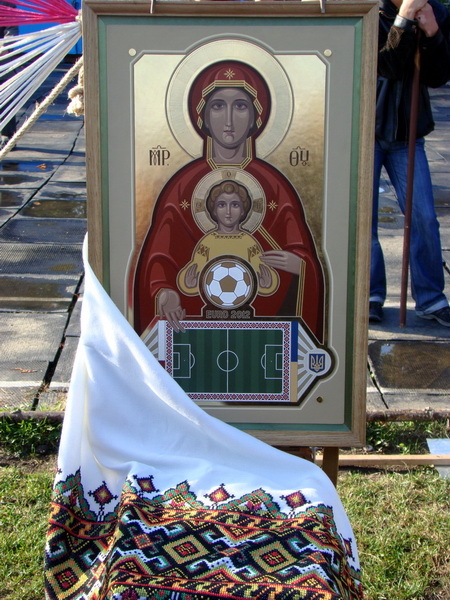 Why does the Mother of God always point to her Son in icons, Michal? Why do martyr-saints point to the cross they are holding, or to a motif of Christ, or to Christ Himself in a supplicatory series? I have given the answer many a time on this forum. If you had paid attention to the answer, you would know why a saint pointing to an angel plowing his field is wrong. Go back and read the Schlock Icons thread yourself. And any other thread on iconography I've contributed to, such as those on St Joseph the Betrothed, and, most recently, the Icons and the Old Testament thread. I've done my homework, don't expect me to do yours. Who are you, again? Why should what you say matter, if what I say is worthless? Mike, this thread is about Gebre Menfes Kidus and his message. Please do not distract this thread from its intended purpose by launching one of your aggressive criticisms of LBK. If that's what you want to do, then take your campaign against LBK to another thread. I guess this will stir up the pot a bit. Here is an example of how Gebre views himself, or at least viewed himself at one time, this site http://dingelmariam.01.free.bm/ was set up by Gebre Tsadik, who is his FB friend and whom he thanks in his book as "Abba Gebre Tsadik" a man, who I am told is a self appointed "priest" who mixes rastafarianism with Orthodoxy, this is what I have been told, I cannot substantiate these claims, although he has another site which looks the same but the church is allegedly based in L.A. and they meet in a Jamaican lounge. I questioned Gebre about this before he removed and blocked me from facebook and severed all ties with me and he explained that this was set up a long time ago and was unaware that he was referred to as a "religious leader" on the site. I am thinking how long ago could this possibly have been? Gebre has been baptized for no more than 4 years or so. At what point was he appointed as a religious leader? Now, he said he was aware of the website and had seen it, but then denied knowing that he was referred to as a religious leader on it. How do you know the GEBRE MENFES KIDUS listed there, is our Gebre? Same way you KNOW his book was authorized...I asked him. So, you asked him, if GEBRE MENFES KIDUS was him....and he said yes, but, neglected to read the phrase, "religious leader" that was associated with his name. Also, per your argument....that Gebre has only been baptized Orthodox for no more than 4 years, stipulates that the label given him on that website, precedes his baptism. Right? If so, why are you punishing him for something that he was guilty of, prior to his conversion? You have to ask Gebre about this if you want to know more, asking me about what Gebre knows are does not know is only setting me up because I cannot know what Gebre thinks or knows concerning this, therefore I must assume based upon what I have to go on. So, instead of setting me up so you or others can accuse me of maligning his character, go ask him. I am merely presenting this to show some evidence to my assumption on why I think he has been dishonest, and he clearly has been. I have no idea when the site was made, or why, or even who made it. I am telling you what Gebre said to me concerning this. But, if he was considered a religious leader by someone, then this could explain the way he speaks and acts. Thinking he can quote fathers he knows nothing about, thereby misrepresenting their teachings as a sort of end justifies the means. Again, this is my assumption on the connection to this website and pseudo-church, ask him. You looked it up, your brought it in to this conversation, and now you wish to appear innocent and direct us to go ask Gebre, lest we "set you up" as maligning his character. Without asking him, let me speculate....the site has not had any updates since 2006. This means it's not been updated for at least 6 years. Per your own words, Gebre has only been Orthodox for four years. Thereby, using your logic, the information entered predates his baptism. Even if he was considered a "religious leader", that also predates his baptism. I'm not saying that Gebre is correct in having misquoted the Church Fathers. If he has done so intentionally to suit his personal agenda, that is between him, his priest and God. His priest is aware of his writings. If he wishes to correct him, he should do so. Many people on this Forum and in the outside real world will misquote others. It is the recipients duty to verify what they believe. Why anyone would consider Gebre's words as doctrine is beyond me. He is clearly a layperson, and never claimed otherwise...not in his books, nor on this Forum, nor on FB, etc. You've made your public correction of his sins....now why must you keep trying to dig up additional dirt on him? You've done your Christian duty....don't become Pharisaical in your judgment and actions towards him. Thank you, Pta. I'm glad another mod had the courage to say this. Look, I made it clear what the intention of showing that site was. If it predates his baptism then so be it. Imagine someone looking to Orthodoxy and stumbles on his book and or his FB page, blog, etc. If they have no understanding how Orthodoxy works then it would be very easy for them to be confused or think he IS some sort of authority or religious leader. The way he present himself and his arguments would suggest to those who dont know better that he has some authority with which to teach. Now, imagine someone from the military reads his anti-military comments or the poem he wrote against soldiers. I am not out to dig up dirt, but for a man who lacks tact and publicly denounces people on a consistent basis, why is it wrong for me to point out the error of his teachings? Why can he openly insult people for being part of "babylon system" and I, after numerous attempts at correcting him, am "digging up dirt" on him? Also, Lyza, you are asking me Gebres intentions and what he knows, that is why I directed you to him, ask him. Me answering for him or what I think is not going to give you an answer as I cannot possibly know his intentions or what he is thinking, I can only assume. If you want to know, go ask him. Yet you seem to know that his intentions are to misuse patristic quotations to fit his belief in pacifism. What other possible reason would he misuse them? I made sure he had access to the writings, he acknowledged receiving the writings on his kindle and said to me that he does not understand them, at least referring to St Hippolytus and said he had not read St. Basil. And for the record that quote cited in the OP by St. Basil, I could not find. So either he quoted them being totally unaware of their canons or other teachings, or he did it purposely. His quotation of Father Stanley Harakas is a great example of this, did he read the whole article? If he did, why did he ignore the summary of Father Stanley Harakas and opt to make it seem as if Fr. Harakas was advocating pacifism? So either way he is to blame for pure ignorance or purposefully misusing the church fathers to suit his own agenda. The fact that he has outright refused to listen to several people tell him he should not do this, he continued. So, based on what we know, what am I supposed to think? Well, you could think, "Maybe I don't need to be the Gebre policeman and I will let this to be resolved between him and his priest"
Hopefully it will be, and I am not attempting to police him. Just point out the errors he refuses to see, thats all. Let's walk through this and see if it makes sense; So just because somebody didn't change their mind after you talked to them, you're gonna take what's obviously a personal issue to a forum that has zero authority to make them change their mind to... make them change their mind? Assuming this isn't a pathetic bid for attention, why not just take the matter up with their priest or bishop? Better yet, why not worry about your own problems? I vote the mods lock this embarrassing waste of bandwidth down. Really. I think we could do worse if folks reading his posts, decided that "peace" is a good thing, and abortion is a bad thing. I haven't read the poem, but, if I had I would have shaken my head sadly. This is America. We have freedom of speech here. You don't have to agree with him. In fact, you ought to stay away from him. Stop reading what he posts on Facebook. Until or unless he states that he IS representing the Church is some capacity, he is free to write what he wishes. As I said, you've done your Christian duty, in advising him of his mistakes, for the sake of his salvation. Now, leave it up to him to either accept your correction or not. Now, just leave it alone, and focus on the next target. That's what Gebre does. There's no need to discern his intent. Why are you saying this publicly rather than use the "Report to Moderator" function? And Lizas point is further proven. Nope, if that is a result of all this then hooray. But if you read through this you would see that I have explained this several times, maybe you should go through and read the several times I have explained this and then maybe that will explain it. Lyza, thank you. I have not discussed anything with him since he removed me. The only reason I am posting here is to make sure that my intentions are clear, despite that they seem to remain unclear to some. Once again, I am not saying that I disagree and that is why I am doing this, I have stated clearly that is is not a personal matter nor a matter of disagreement. The OP is clear that I have an issue with him continually misusing fathers and others writings to justify his stance. I know that some perhaps think this is a personal grudge, the fact is, Gebre and I know many personal things about each other, either of us could easily have turned this into a public mudslinging contest, but he remained silent and I did my best to stick to the issue that I have a problem with. I know Gebre seems to think I have betrayed him, and thats fine, and that I am maligning his character, again he is free to think whatever he wishes when it comes to people criticizing his methods or views, and like I said many of us have pointed this particular issue out to him on a number of occasions. This is his way of dealing with it, making me or others the "bad guy." I will tell you this, I would NOT have given my daughter his recently deceased daughters name if I did not feel some sort of connection with the guy. It truly is unfortunate that he uses dishonest methods to mislead people, wether he knows it or not. But him outright refusing to listen is a serious issue, in my opinion and others who are close to him. He flat out told me that he does not need me giving him any advice. Well, I would hope that the person would, if they had the misfortune of stumbling upon this site, read the OP first to see that this is not even an issue of two opposing views disagreeing, or even about religion, but about someone being dishonest. I would think that someone coming upon this site and seeing that it is filled with all sorts of religions, not just Orthodoxy, that would be odd for them as it was for me. Why is the name even OrthodoxChristianity.net if its for everyone? That in itself is confusing. Misfortune to stumble upon this site? Really? You must be very unfortunate, because you stumbled upon it. Why is it called Orthodox, and open to all? How better to teach the non-Orthodox, then to allow them to freely come and ask questions, and discuss beliefs? So.....you expect these folks to have some -discernment- about the content here....and be knowledgeable enough to know the differences between who is wise and who is full of horse pucky, considering almost everyone here postures at being wise and correct. Yet you cannot see that these -same- folks, who would be likely to stumble on the other sites in question, would lose ALL that knowledge and discernment? Do you see the issue with that logic? Maybe you already answered this, but what is the passage or paragraph Gebre wrote that disturbs you the most? Generally the ones we discussed so far seem arguable. Also, I don't know what Gebre's relations with Ras Tafarianism before becoming Oriental Orthodox have to do with the OP of this thread, which is supposed to be about his pacifism. I will, this thread is an ABOMINATION!!!. You obviously have personal gripes. I do not, even though we disagree on many things. The similarity of what is going on here to bullying (primarily by you and Ioannes and LBK) is clear to me because I have been dealing with the after effects of this problem for a long time and at great cost. It seems to me that your view of the topic of this thread is about three members of this forum complaining about Gebre. It seems to me if you have problems about his posts, you should deal with it in the thread that he posted. In reading this thread how many people are participating in your gripe? Not many. You are wrong about what this thread was about based on the initial post, you made it much more than that. Peter tA, LBK, Ioannes, please post what your priests think about this thread. You do realize that I've also been just as outspoken in my criticism of Ioannes's deplorable tactics on this thread? I've been hard, but I've been fair. You do realize that I've also been just as outspoken in my criticism of Ioannes's deplorable tactics on this thread? By that I am it appears that you have been supportive of this thread. I am not. Then please take the time to realize it. As I said, I've been hard, but I've been fair. That's fine. I don't particularly like this thread, either, but I see no reason to override my colleague's decision to keep it open. If there was ever a time to support abortion it would be for this thread. Maybe we should start another thread on this, but since it seems appropriate here. I think everyone should be required to post their parish name and location, with priests name, email and phone number, as well as their Bishops corresponding information. You know, just in case we need to contact them later based on what someone says here. In the event they need to be punished corrected. Thanks Peter. I think what disturbs me the most is that someone must confess to false OCnet Priests/Priestesses based on what they wrote or believed before they became Orthodox. This is what bothers me. It would be appropriate that I warn every potential covert of this abuse here. Does that make sense? Am I misreading this thread? I'm not sure I understand what you're talking about. Would you please enlighten me? Kerdy, I was only suggesting that they should consult as to whether they are on the right path. Don't lampoon me on something that I think is important. I was referring to Liza's posts above. It is 11 pm and I have to wake up at 5 am so I will quit now. It wasn't in response to your post, rather to Ioannes' demand to know Gebre's information and Gebre didn't give it to him. Much of this thread is interesting, but I can not get past the fact that the title is directing it towards the point of view of one poster. I would hate to see us devolve to a series of posts doing just that. It would tend to stifle the expression of provocative or unpopular points of view and transform the board into a "Hallelujah Chorus" of self righteous triumphalism or a boring place of the repetitive self-evident. There is plenty of room to dispute or counter a post in the body of a thread with which we take issue.